Easy checkin, spacious room, quiet even though close to road, pleasant grounds. It was a delight to be welcomed by John & we were very happy with the generous size of our room. Thanks for a wonderful experience. John, the owner, was very welcoming. We stayed two nights, both ways on a trip to Victoria and back. The room was clean and comfortable. The bathroom a little dated but still clean and serviceable. Meals across the highway at the Truck Stop are cheap, huge and good quality. Gilgandra is a good half way point for a stopover to the Sunshine Coast where I was heading, and I wanted a quiet, comfortable stopover. John's welcome was warm and friendly, and the position of the motel is set back from the highway, so that and a comfy bed gave me a good, peaceful night's sleep. Plenty of hot water for a shower in the morning set me up for the day's travel. I will definitely use this as a half way point for the next journey. Excellent friendly service.Quiet location near highway but no truck noise. Fantastic place to stay. Welcoming and lovely and clean. Plan on staying there again for sure. Overall very happy with the room and the service. Great for a overnight stop. Pool clean, which the kids enjoyed. 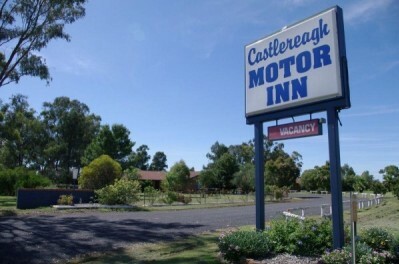 © Copyright – Castlereagh Motor Inn Gilgandra All Rights Reserved.